This is the first of two new wrecks for Protaras Cyprus.The Liberty Shipwreck was sank in May 2009, Protaras area, purposely sunk for artificial reef and scuba tourism in Cyprus. The Liberty wreck is located in artificial reef zone of the Protaras area. This area will also be closed for boat traffic, making this an environmental marine fish reserve for Protaras in an area ideally suited for marine life to prosper. Located just 90 meters away is the Nemesis Shipwreck, another great wreck that can be discovered with Easydiverscyprus. It has attract has an abundance of marine life (18 – 28 metres) for qualified divers only. This is a boat dive and must have dived from a boat before or have experience on boats and wrecks. We prefer you have experience due to the nature, depth and location of these wrecks. The ‘Liberty Shipwreck’ is a small Russian cargo ship which sunk in Protaras in May 2009. It has an overall length of 37m and a width of 10m. 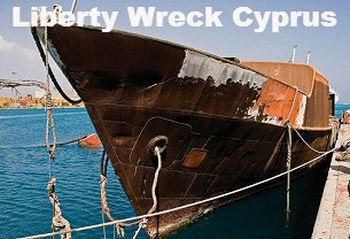 The Wreck of Liberty is located in approximately 1 kilometre from the shore in Protaras and is just a short boat ride. This is a relatively shallow waters dive and very good visibility make this shipwreck ideal for all levels of divers! The maximum depth is 28 meters and for this reason we ask only certified divers with experience of diving from boats and on wrecks for this dive. If you would like to dive the Liberty Wreck in Protaras or would like to find out more information. Click the Ask A Question Button Below.